To offer a quick answer, Bitcoin is clearly bubbly, not unlike the stock market itself is, but over a shorter period of time. In fact, that statement sums up my theory on what is happening. Bitcoin is a new and important currency/asset finding its legs in hyper-speed. It is like the stock market from 1910 – 2010, playing out over the course of 10 years (roughly then, the Bitcoin market is a bubble-and-bust economy moving at something like 10x to 20x speed). NOTE: You can use this referral link to sign up for binance, a popular crypto exchange (currently using this as a test). Bitcoin, it just sort of does this over and over. Thus what we are seeing are many mini-bubbles and a result that one could call a bubble, or could just call the result of supply, demand, a dash of manipulation, lots of emotion, and the general dynamics of markets creating a bubble-and-bust economy. The Bitcoin bubble we saw from 2017 to 2018 wasn’t the only bubble or the end, it was more like the NASDAQ from 1994 – 2004 in a 10 month period (let’s say June 2017 – March 2018 to make things simple; here a month in Bitcoin is a year in terms of the NASDAQ… a 12x speed). That doesn’t mean that Bitcoin isn’t a grand bubble that won’t pop and correct by 50%+ only to enter a long bear market (that has happened before in stocks and Bitcoin and the threat is real). It only means that it is more likely that the Bitcoin bubbles and busts will continue to occur and on a quicker time frame than in the traditional markets. In fact, history thus far points to the idea that Bitcoin and cryptocurrency in generally will continue its mini bubbles (rising and falling 25%, 50%, or more) until it finds its ideal market cap and then stabilizes from there. All of that said, Bitcoin clearly has almost every feature of not only a classical economic bubble, but a series of mini bubbles repeating over and over (like in the stock market over time). A big difference between Bitcoin and past bubbles is however substantial. It is that the underlying asset (Bitcoin) has value and purpose (like the stock market itself, but unlike say Enron’s weather futures). Thus, one shouldn’t be so quick to assume they have Bitcoin figured out. If we all did, we would all be rich. NOTE: Not all cryptos or crypto related products have value and purpose on par with Bitcoin. One way this is like the dot-com bubble is that third party tokens are being given absurdly high valuations (like off-brand dot-coms were in the dot-com bubble). The bubble and bust nature applies to the market as a whole and to the top coins with proven value, many other lesser tokens are less likely to keep going. Time keeps on slipping… into the future. And thus we grow wiser in retrospect. Below are some updates before we get to the original article. UPDATE JAN – FEB 2018: Bitcoin entered a correction phase where it lost 50%+ of its value from its high (nearly 75% at one point). This downtrend has been somewhat gradual, and for a cryptocurrency it isn’t particularly abnormal. Clearly a bubble has popped within Bitcoin’s bubble and bust economy. However, to truly consider the entire asset class and Bitcoin itself to be “a bubble that has popped” will take further declines and a failure to recover to confirm. Popped bubbles look like this, for us to see that on a chart we need to give Bitcoin’s chart more time (and we need to be able to hold off on the champaign for weeks and months while we let what appear to be recoveries play out). The first part of the bubble and bust looks like a classic bubble, but we don’t know the next phase. If you look at the graphs below, you’ll see that each correction so far has looked a bit like a popped bubble. Consider the following images, for us to be fully sure we need time to consider what happens next. The classic economic bubble compared to Bitcoin. The Bitcoin bubble compared to the .com bubble. Notice how a popped bubble can end up being just a phase in a bigger pattern? UPDATE APRIL 2018: The last return to the mean phase was “a sucker rally” AKA “bull trap” in which people lost a lot of money on paper (See the dot-com vs. Bitcoin image below to see more examples of bull traps). Now however, in April 2018 it again looks like a return to the mean phase. Some cryptos have rallied upwards of 70% in under two weeks (after falling nearly as much if not more in March). This is very clearly a bubble and bust economy on a number of time frames. Economic bubbles are arguably an advent of the human condition + speculation + credit. Cryptocurrency is the perfect mashup of global market, light regulation, human emotion, speculation, and credit… and thus it bubbles and it busts, and bubbles and busts, and bubbles and busts again. Will it bust next or wll it bubble some more? That question can only be answered in retrospect. One good thing about a bubble and bust economy, as opposed to just “a bubble,” is that you can be pretty sure that it will bubble and bust again, which makes it just ever so slightly predictable. Check out the chart below with Bitcoin bubbles overlaid from 2011 to 2013. It is likely this pattern will keep repeating at a rapid pace for as long as cryptocurrency remains a viable option (although periods of stagnation in between should be expected). An overlay of past Bitcoin bubbles. Comparing the dot-com on the left with the Bitcoin bubble on the right. Notice how juts that look like the start of a new rally end up being not. Still, in both cases, bubble pops aren’t the end. TIP: In Bitcoin and cryptocurrency “corrections” can be pretty intense. Historically corrections have been between 20% – 50% (although a few have been 80%). Just because it drops 80% doesn’t mean “the bubble has popped.” Crypto is a bubble and bust economy, so there will be lots of mini bubbles forming and bursting. From that perspective, what we really want to know here is, “will a big bubble pop from which Bitcoin will not recover?” A given 50% correction (or even more) for a short period of time doesn’t exactly prove much. Further, this is common in other markets, Bitcoin just moves quickly so the effects are more intense. 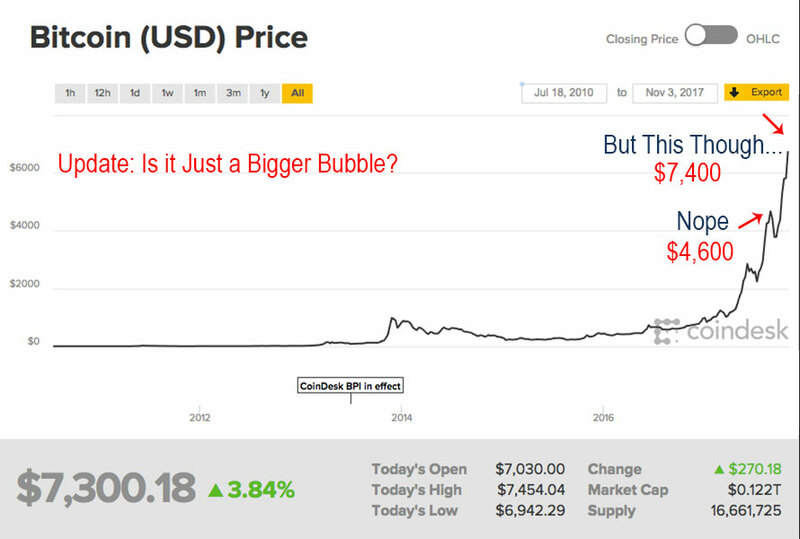 Is Bitcoin a bubble we asked in October when the price was 1/4th of what it is here on December 13, 2017. Potential Bitcoin Bubble as of Nov. 3rd 2017. This looks like a bubble pop for Bitcoin. But we’ll need to wait to confirm. Necessary disclaimer: This article is not meant to be taken as investment advice. See full disclaimer in the sidebar and links in the footer. That said, to offer friendly advice, be conservative and don’t risk more than you can comfortably afford to lose when investing in cryptocurrencies like Bitcoin (also, consider averaging in to get an average price and setting stops if there is a price you know you would sell below if it is a bubble and it does pop). On that same token, don’t panic and sell based off the events of a short duration of time. Bitcoin can see multiple 20%+ corrections a month. The market is volatile and has a history of mini-bubbles, busts, and recoveries. TIP: If the terms on this page are confusing you, feel free to use our sister site cryptocurrencyfacts.com for reference. Why Do People Think Bitcoin is in a Bubble? The price of Bitcoin (BTC) in late September 2017 (the time when this article was written), as one can see in a chart that compares USD to BTC, looks like it is in the midst of a classical economic bubble. An overvalued asset… Maybe? That point is debatable. In other words, Bitcoin has all the markings of a [semi-popped at this point] bubble here on September 28, 2017, just like it did back in 2013 after its quick initial rise to the top, and just like it had a few times in the past. Since Bitcoin has all the markings of a classical economic bubble, traditional investors who (if they study history) have seen many such bubbles, think Bitcoin is in one. Simple as that. In fact, if we define “bubble” as “quick rise in prices, speculation and borrowing, excitement, and then quickly deflating prices and excitement” then its hard to argue that Bitcoin isn’t seeing a bubble. However, if we define a bubble by both its rise and its popped state (that is, a state of quick decline followed by a length period of stagnation) then it is from that perspective that the future is a little less clear. In other words, it is hard to argue against the idea that Bitcoin is in a bubble of sorts, but that doesn’t mean it is in a traditional bubble or that the next event is giant panic and pop. 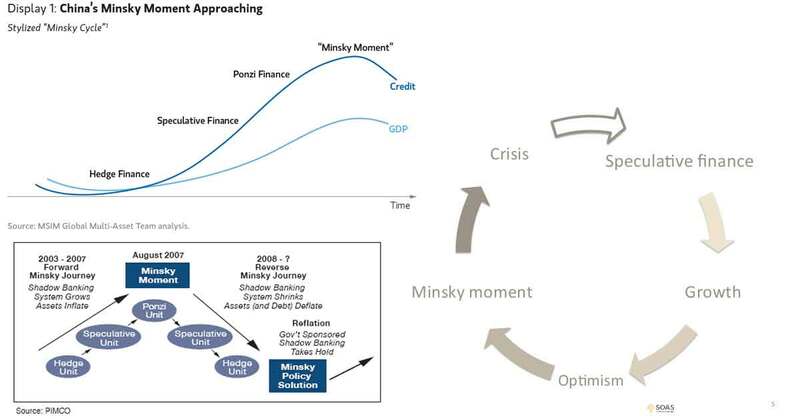 Some of the logic behind a classical economic “speculative” bubble according to Minsky’s theory. NOTE: The video below shows the top 5 Bitcoin crashes. Even though today they can be hard to see on a chart due to rapid growth in 2017, there have been a few times in the history of Bitcoin where the price went way up in a wave of excitement and speculation only to fall back down (see a history of BTC’s value). In other words, Bitcoin has a history of bubbling and busting as new demographics get excited about the technology (both the underlying blockchain and the overlying cryptocurrency token Bitcoin). Of course, it also has a history of recovering and soaring to new heights. After some initial waves of adoption from 2010 forward, the digital asset class known as cryptocurrency exploded into the mainstream in October of 2013 with Bitcoin leading the charge… only for the entire market to crash back down again starting at the end of 2013. Then, after a “lengthy and somewhat depressing period of stagnation following the euphoric high” the whole thing happened again in 2017, but this time with a much greater effect, dropping from a high of $5k to $3k in a matter of a weeks after China announced it would ban ICOs (the offering of new coins). That manic bull-run to the top fueled by speculation and the panicked sell-off are the markings of the classical speculative economic bubble built on hype and hot air (although Bitcoin isn’t hot air, there is a lot of hype). Thus, for the above reasons, people have taken to claiming that “Bitcoin is in a bubble” (and since most other cryptocurrencies follow Bitcoin’s price, that they are in a bubble too). That however is, like, you know, just an opinion. The reality is: PAST RESULTS DON’T AFFECT FUTURE OUTCOMES (they can be good indicators, but, in simple terms, all independent events are unique). The progression of a bubble in loose words: People get pumped on an asset class, people speculate, people get more pumped, more speculation, marketing, new businesses based on that asset class coming out of the woodwork, OMG the market is still up, it’s going to infinity, let me leverage my life savings against it, still up… $5k bitcoins are real says the guy pumping your gas, ok big bet, and … oh …. no … one bit of bad news (China ban, silk road, whatever) just dropped the price to $3k. Boom crash, panicked sell-off. The exchange called my margin in. Now I’m broke (or have taken a loss). Apparently all that bullish growth left people with weak knees and they couldn’t withstand even the slightest bit of bad news, that is too bad because I was going long. Darn, I should have sold high. Something like that. Inflation and Bubbles and Tulips: Crash Course Economics #7. TIP: To the tulip bubble analogy’s credit, the thing with the tulip bubble was that one day there were no buyers at the high price and the price started crashing. No one wanted to re-enter the market, no one wanted the asset. If everyone gets spooked off of bitcoin, and everyone goes to sell, there will not be enough buyers (if we can judge by the current market). That is, a lot of people are holding BTC right now, if those holders start to sell, if they panic, then it won’t be pretty. 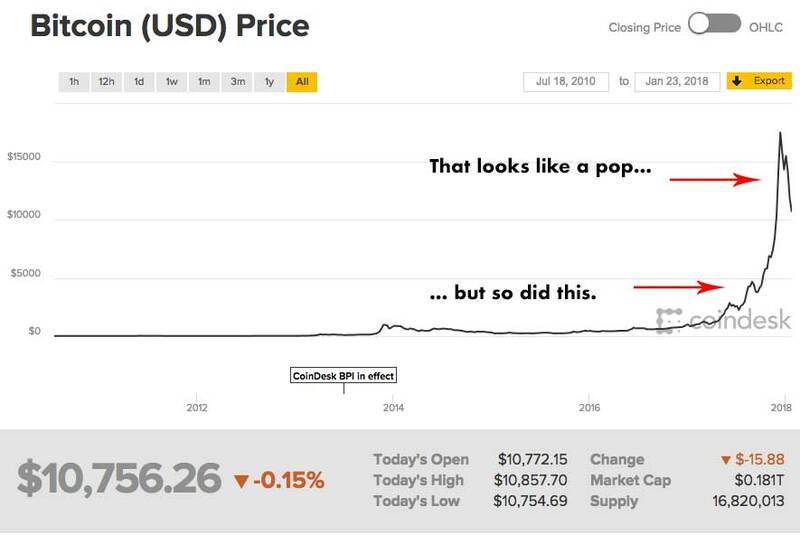 In a case like that, the bubble could pop hard like the tulip bubble. However, that assumes people will stop wanting Bitcoin like they stopped wanting tulip futures… and that is hard to see that really happening at this point. In other words, there are lessons to learn from tulips, but we can’t really directly compare a future tulip bulb with a global digital currency / asset that you can use in an exchange today? I don’t think so, that is one reason we’ll look more to the .coms and another tech bubbles below. Recession, Hyperinflation, and Stagflation: Crash Course Econ #13. What Bubble is Bitcoin Like if it Is in a Bubble? After-all, the .com was a bubble built around excitement about new tech (which caused people to overvalue web-based companies who didn’t have the profits to back up the hype), so that checks out. Meanwhile, the tulip bubble is the classical example of a bubble (along with early bubbles like the South Sea bubble). So it makes sense to note when talking about bubbles. The Dot Com Bubble Explained in One Minute. What causes economic bubbles? – Prateek Singh. However, despite those references, and despite agreeing that the .com bubble is worth noting in this conversation, I would argue that the real bubble to compare the potential cryptocurrency bubble to here in 2017 is the North American Video Game Crash of 1983. 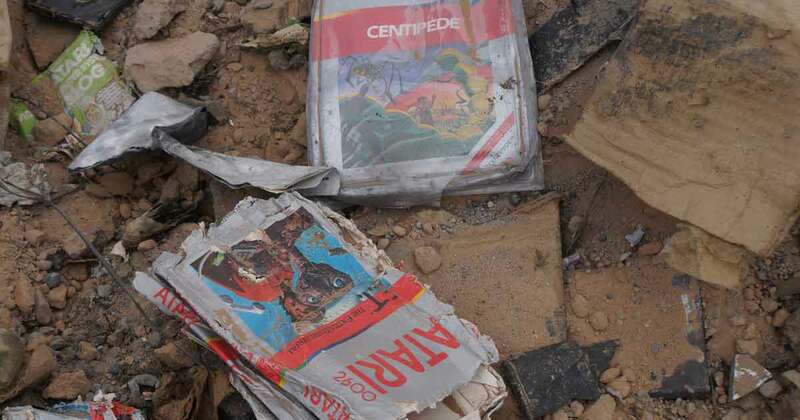 Games from the actual Atari burial ground. The reason for comparing the current 2017 cryptocurrency market to the Video Game market before 1983 is not due to price, but due to the rapid production of off-brand products (in the case of cryptocurrency, ICOs and Altcoins). Consider, the Video Game Crash was the result of over-hyped “crummy” third party games and systems, produced in quantities no one could ever consume (and that the market never demanded), paired with great products (the “bad” E.T. game paired with the popular Atari system for example) and great ideas (video games you can play on your home TV). NOTE: The .com bubble had elements of this, as there were lots of “bad” website-based companies that were over-hyped, but that bubble has been the goto, where the Video Game Crash hasn’t been getting much press (thus, our focus on it here). Now consider, Bitcoin itself is a really solid concept (and the leading cryptos, say the top 10 by market cap, tend to be too), just like playing Atari games at home was a really solid concept. Bitcoin, like other top cryptocurrencies, is a decentralized digital currency you can use world-wide, trade, invest in, and even develop if you have the chops! It is built on revolutionary blockchain technology. It, in short, has a lot of use-value for what essentially amounts to passwords to a contract on a public ledger. What isn’t as solid is the countless altcoins and ICOs rushed to market, for which there is only a limited demand, seeking to capitalize on the Bitcoin boom of 2017. When many novices enter a market on the supply side, and when they get preyed on and burned by those seeking to make a quick buck (including well intentioned novices on the demand side), it weakens the resilience of an already green (and thus likely weak kneed) market. It also spreads thin the capital of investors in the market. By the time people got the ET Atari game for Christmas, the idea that “video games are cool” was over in America. People had bought too many crummy off-brand systems and games, and department stores had overstocked their shelves. There was too much supply, and no longer any demand. People threw out their off-brand systems and games and went back to physical pong. They declared the silly video game fad over. In other words, it was economic, and it was psychological, but it wasn’t a result of the underlying product being a Ponzi scheme built on hot air (like Enron’s weather futures for example). TIP: In other words, what if the deflating of cryptocurrency’s price here in late September 2017 isn’t purely a result of some bad news or over-speculation (obviously it is that a bit, but what if it isn’t just that)? What if it is that investor’s money is being spread out into many different digital assets as new ICOs launch? What if all the new people entering the market to try out ICOs have a bad experience? That series of events, mixed with the roller-coaster like movement of cryptocurrency in general, could lead to a long downturn (and not just manic and depressive price fluctuations like we have seen to-date). That is speculation, but something to think about. The Video Game Crash of 1983 – Gaming Historian. If enough people get burned from ICOs and altcoins, the result could be that people lose interest in cryptocurrency and go back to fiat currency and traditional securities sold on the stock exchange (for a few years). 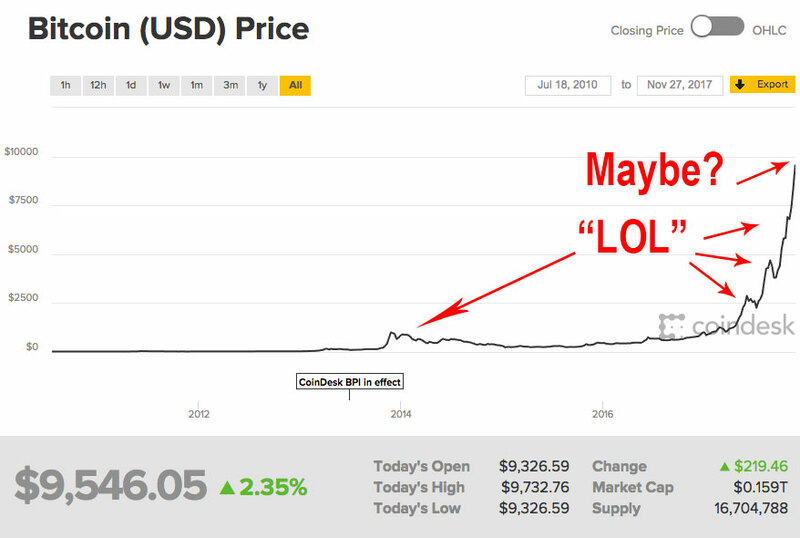 When people got sketched out about the Silk Road, it took a few years for BTC to come back. When people got burnt by the .com bubble, it took about a decade for stocks to bounce back. I don’t see how cryptocurrency doesn’t survive long-term personally, but the short-term future with all the potential and actual bans and regulations, the already volatile market, and then all the ICOs could pair together to create the bubble and bust many have predicted. Still, I don’t think the bubble will pop because everyone realizes they have contracts to tulip futures and weather futures (Enron), AKA “hot air,” in terms of Bitcoin. It will take more than that. If it pops, it will be because major countries have regulated it to death and/or “ten thousand” Bitcoin knock-offs that make dogecoin look like high art jacked everyone for their first investments into this exciting new space of digital assets (although, ironically, governments banning ICOs could be what saves the market from itself in this respect). Like with the .com or video game bubble, the danger isn’t in the idea or some of the products, the danger is in the psychological effect of too many mid-and-late stage adopters in the market getting shaken by the ups-and-downs, paired with bad news, paired with a market flooded with third-party coins and hucksters. So yes the .com bubble is one to keep in mind (it is very relevant, especially long-term), but let’s throw out the insulting tulip futures bubble or South Sea bubble metaphors (that imply there is no worthwhile asset here). Bitcoin and some other cryptocurrencies are solid concepts, it is what is happening around them (not the coins themselves) that should be the concern. TIP: Learn more about bubbles. Or, learn more about cryptocurrency from our sister site (where we have been writing about cryptocurrency since 2015, after getting interested in it around the time of the first bubble). TIP: Bitcoin could very well not be in a bubble, but rather just seeing a meteoric (yet volatile) rise in price in which hard downturns should be viewed as corrections. Those who claim to know if Bitcoin is in a bubble are not are essentially just offering their opinions. Want a less gloomy opinion, check out this article asking “is Bitcoin in an S-Curve?” Yeah, it could be crashing to the ground soon, or it could do what it did in early July with even more vigor this time. Again, no one can say until happens (although after it happens, every who predicted correctly is sure to say “I told you so”).